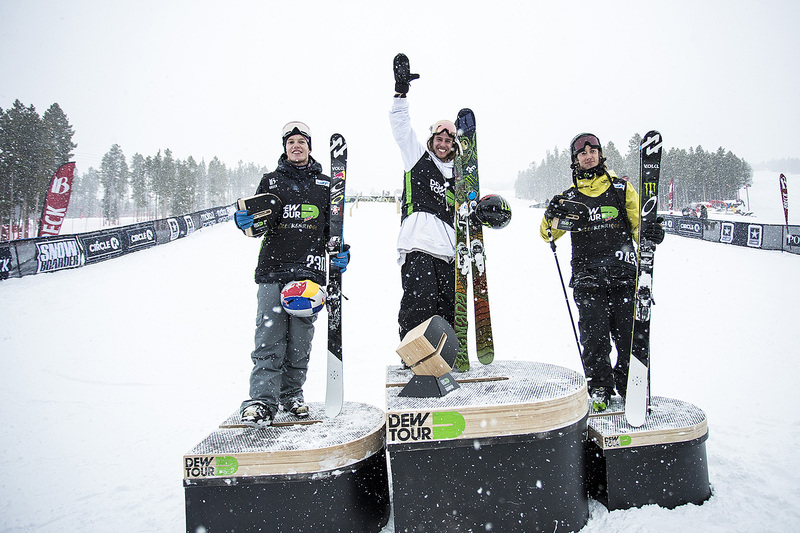 Saturday at the Dew Tour kicked off clear and sunny, making athletes hopeful for better competition weather than yesterday. Unfortunately, heavy winds brought in a big storm in the afternoon, just in time for the slopestyle jib competition. The revised structure for the slopestyle jib gave each athlete 3 runs, with their top score counting towards their overall competition standing, combined with their slopestyle jump score from yesterday. Despite the ugly weather, the crowd for today’s event was energetic and engaged, cheering phenom Kelly Sildaru on to first place overall. Coming in with a 17-point lead, Sildaru was a formidable opponent, but Montana’s Maggie Voisin handily closed the gap to just 6 points with an impressively smooth run including 270 out on the final rail, the fourth feature in an elaborate course that was sticky with fresh snowfall. The ever-positive 17-year-old celebrated with a huge group hug from Devin Logan, Isabel Atkin, and a handful of other competitors. 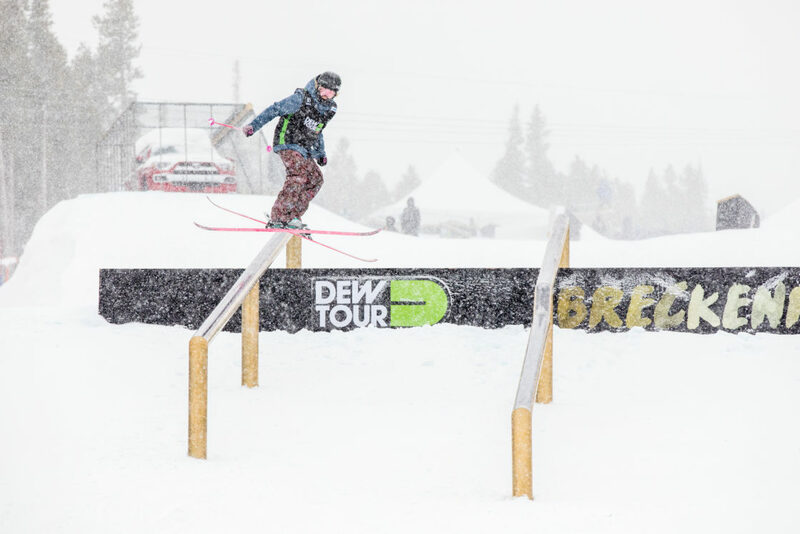 Maggie Voisin hits the final feature on Dew Tour’s reimagined slopestyle jib course. The storm worsened as the men’s contest began, but the crowd persevered, cheering on a much more diverse performance across the board from the male competitors. Where the women tended to favor similar lines and cleanly executed traditional tricks (of the four bottom rails, the women hit the same one in all but a few runs), the men took advantage of the entire course, hitting a wide variety of features including a caged Toyota four-door and a folded wall-ride. Some of the most creative skiing came from Canadian Vincent Gagnier, who incorporated a full body-slide on a c-box into each of his runs. The crowd went wild for a handful of creative flips, including Jesper Tjader’s under-flip to a rail, but the judges favored technical spins over the crowd-pleasers, and Henrik Harlaut took first thanks to his consistently technical, complicated runs executed with effortless style and relaxed attitude. Coming in second, Norwegian Øystein Bråten was thrilled to share the podium with Harlaut. Alex Beaulieu-Marchand of Quebec took third, and the crowd and athletes quickly headed down to the base to warm up and get ready for the evening’s events–including ski and snowboard film screenings and a Joey Badass and D.R.A.M. concert in downtown Breckenridge. The town floods with Epic Pass-fueled crowds during the weekend and is well known for its thriving aprés scene, and the evening didn’t wind down until well into the early morning. After-parties packed with athletes, locals, and weekenders spilled out onto the sidewalks well after the bars closed. Men’s individual competition wrapped up with Henrik Harlaut, Øystein Bråten, and Alex Beaulieu-Marchand atop the podium. On final day of competition, athletes will compete in a new format, a team event. Weather permitting, athletes will revisit both the slopestyle jump and jib courses, seeking glory for their ski sponsors. Armada, Head, K2, Volkl, Atomic and Faction will each send two athletes into the fray. Follow the live webcast of the rails on Powder.com on Sunday, and go here for more extensive coverage.